This past weekend my boyfriend had a high fever and body aches. We worried that he might have contracted flu from a coworker. We also worried that I might get the flu, despite the flu shots we both had in the fall. On Monday the fever spiked high and we decided to go to an Urgent Care facility instead of the hospital. I’d never been to an Urgent Care place before, and was afraid it would be chaotic and exhausting like a hospital emergency room. I felt my stomach clench in fear as I tried to find directions to the clinic, while battling anxiety that we needed to hurry to mitigate the high fever. Later I realized that the fear in my body expanded at my reaction of “I am alone here. I must handle everything myself.” For those minutes, I felt overwhelmed and unsafe in a vast world of disconnected, random occurrences. My mind played out terrible scenarios which triggered more anxiety and tightness in my stomach. When we arrived at the Urgent Care facility, I was relieved to find the administrative system clear, the medical attendants polite, calm, and unstressed. Soft classical music played in the background. After a short initial wait time, the doctor and nurses took my boyfriend’s vitals, then took us to a quiet curtained alcove to ask specific questions. The doctor considerately dimmed the overhead fluorescent light and suggested my partner lie down on the examining table while we waited the half hour for the flu diagnosis. I felt a wash of relief, and recognized that in this place someone had purposefully created a kind, helpful system for patients and their supporters. I breathed in and out, finding my center again. When the diagnosis of ‘not flu’ arrived, we were both able to evaluate calmly the doctor’s suggestions as to what to do next, and make a decision. A friend of mine who is a research scientist is now guiding many PhD candidates on their theses. He wants to do everything in s scientific way, but he is a poet, and as a result he often is not very ‘scientific’. Last winter he went through a tremendous spiritual crisis. Hearing of this, I sent him a drawing of a wave riding on silky-smooth water. Beneath the drawing I wrote, “As always, the wave lives the life of a wave, and at the same time, the life of water. When you breathe, you breathe for all of us. As I wrote that sentence, I swam with him to get him across that time of difficulty, and fortunately, it helped us both. Most people view themselves as waves and forget that they are also water.When I viewed the world as faceless and uncaring, I was filled with the fear of being a separate wave cut off from my source of support. But as I received deliberate care and kindness interacting with the nurses and doctors at the facility, I remembered that I was water as well as a wave. I breathed in and out, recovering my sense of myself as a human being connected with larger humanity, just as a wave is made up of water. Most people view themselves as waves and forget that they are also water. They are used to living in birth-and-death, and they forget about no-birth-and-no-death. 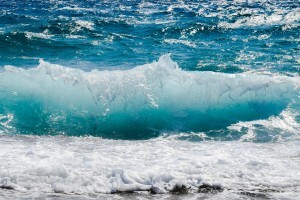 A wave also lives the life of water, and we also live the life of no-birth-no-death. We only need to know that we are living the life of no-birth-no-death. All is in the word ‘know’. To know is to realize. Realization is Mindfulness. All the work of meditation is aimed at awakening us in order to know one and only one thing: birth and death can never touch us in any way whatsoever. I have not reached this certainty of knowing that Thay talks about, but I do catch glimpses in my daily life and daily practice. This Thursday night, after our regular sitting, we will share our experiences of being both the water and the wave. We’ll explore what helps us remember that we, as humans and as part of the earth’s living ecosystems, are all in this together. You are warmly invited to be with us. As is our tradition on the first Thursday of the month, we will also offer a brief newcomer’s orientation to mindfulness practice and to the Still Water community. The orientation will begin at 6:30 pm, and participants are encouraged to stay for the evening program. If you would like to attend the orientation, it is helpful if you let us know by emailing us at info@stillwatermpc.org. A related excerpt from Thay on “No Birth, No Death” is below.http://info@stillwatermpc.org. When we look at the ocean, we see that each wave has a beginning and an end. A wave can be compared with other waves, and we can call it more or less beautiful, higher or lower, longer lasting, or less long lasting. But if we look more deeply, we see that a wave is made of water. While living the life of a wave, it also lives the life of water. It would be sad if the wave did not know that it is water. It would think, someday, I will have to die. This period of time is my lifespan, and when I arrive at the shore, I will return to nonbeing. These notions will cause the wave fear and anguish. We have to help it remove the notions of self, person, living being, and lifespan if we want the wave to be free and happy. A wave can be recognized by signs— high or low, beginning or ending, beautiful or ugly. But in the world of the water, there are no signs. In the world of relative truth the wave feels happy as she swells, and she feels sad when she falls. She may think “I am high,” or “I am low,” and develop a superiority or inferiority complex. But when the wave touches her true nature, which is water, all her complexes will cease and she will transcend birth and death. We become arrogant when things go well, and we are afraid of falling or being low or inadequate. But these are relative ideas, and when they end, a feeling of completeness and satisfaction arises. Liberation is the ability to go from the world of signs to the world of true nature. We need the relative world of the wave, but we also need to touch the water, the ground of our being, to have real peace and joy. We shouldn’t allow relative truth to imprison us and keep us from touching absolute truth. Looking deeply into relative truth, we penetrate the absolute. Relative and absolute truths inter-embrace. Both truths, relative and absolute, have a value.